Back-Up Story: "The Origin of Eclipso"
Klarion reiterates that helping Mary last issue warrants a price - a taste of her power to help tame her inner rage. Mary prepares for an exchange more in defiance of Zatanna and her lack of help. Klarion proves he is as untrustworthy as Mary had suspected by attempting to drain her magic. Mary smashes Klarion and his cat Teekl to the ground and explodes in magical rage destroying much of the surroundings before a ghostly voice stops her from executing the two backstabbers. The voice goads Mary to follow it and growling through gritted teeth she takes to the air leaving Klarion to face the townsfolk who's livelihood Mary had destroyed. The mummy that had been guarding the door threatens to slice Trickster in two and a drowsy Piper wakes up from the sucker punch just in time. The musical maestro begins to play a tune to hypnotize their adversary but his flute vanishes! Wally smugly grins introducing Hassan, their guardsman. The Flash smiles and confiscates the duo's weaponry. He does however permit them to order room service. Piper and Trickster are pretty angry that though they tried to help with a warning to Flash and his friends the wedding was still taking place, not to mention they faced a possible mind wiping. Searching for something they could use to escape they discover the phone handset. Quickly Hassan is dispatched into a speedy unconscious state and our two brightly colored villains escape unnoticed. Jimmy arrives in the secret Cadmus installation to learn more about his powers where the Justice League and Teen Titans had failed. A silent Dubbilex and head of genetics - Serling Roquette greet him and he reveals that his powers are involuntary. Jimmy mistakes Serling for Mickey Cannons daughter and he's promptly corrected. Despite her young age she's not what she seems. She asks Jimmy why he took up the Mr. Action role as a Superhero when he gained powers. Jimmy explains he's been honored to be Superman's pal but he's always harbored jealously for the role of a hero. He always wanted to be among the ranks of the heroes he admired. The bachelorette party is in full swing. Black Canary worries that if even a snapshot appears online that all the Superwomen in attendance would have their careers and lives ruined, Barbara Gordon laughs it off revealing that there are countless websites with fake pictures and information and its all thanks to Adobe. Lady Blackhawk is passing round pomegranate margaritas of her own recipe and they are sick inducing. Cue two silly underage girls trying desperately to fit in with the adults. Lady Blackhawk entrusts Wonder Girl and Supergirl with the responsibility of reloading glasses. Wonder Woman steps in and plays the responsible adult. She confiscates the foul tasting beverage warning them that attending the party was bad enough but they are minors and need to grow up. Lois bumps into Barbara, confirming her suspicions that Barbara is Oracle (see Birds of Prey) Lois agrees that while they are in a social setting Barbara is safe... for now. Barbara smiles and exchanges a bitchy comment. 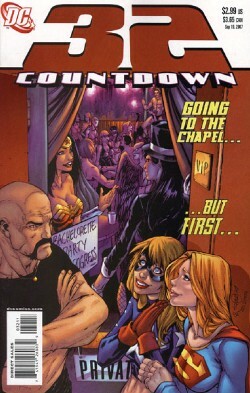 The token underage girls sneak a few cocktails behind Wonder Woman's back and giggle that they will finally taste alcohol. Diana may have missed the conniving duo but Zatanna hasn't. The margaritas transmute swiftly into ginger ale! The bouncers grin at watching the superwomen horsing around socially and wonder what surprise is next - enter Hassan the super mummy hot on the heels of Piper and Trickster! A bored Barda and Lady Blackhawk race into the beatdown leaving the minors with the alcohol and naturally they have to do it and of course it's the disgusting concoction Blackhawk had mixed. Before the whimpering Piper and Trickster face the killing blow, Zatanna turns her guard into a pile of dust, and apologizes to Black Canary for ruining the party. Supergirl and Wonder Girl are writhing in weakness after one glass of the alcohol and while the clean up goes ahead Trickster and Piper sneak away and steal a Porsche from the lot and head off into the night. The trail of Ray Palmer runs through Earth 30, home of Red Son Superman - but the direction they've taken is wrong. The Atom isn't there and Bob's brethren it seems are intent on leading them as far from their goal as possible. Just as Red Son Superman is about the confront the intruders to his Earth - they vanish. They reappear on Earth 3, home of the Jokester. Ion causes ructions in the team confronting Jason for leaving Ryan behind. Before fisticuffs Bob steps in and reminds Ion that Ryan has another path to follow and their job is to find Ray. Donna agrees that it is wrong to ever leave anyone behind. Mary it seems was left off the guest list of the party and she is intent on following the ghostly voice to its source. Mary is curious as to how they are similar as the voice claims. The voice points out she was also an ordinary girl granted ancient godlike power, betrayed by her closest friends... she is ECLIPSO! In the beginning God had the Spirit of Wrath, his servant to punish the wicked and cleanse the world of vice and iniquity. However with the Old Testament giving way to a fairer, more balanced God, Wrath was stripped of his rank and replaced by The Spirit of Vengeance - The Spectre. Apokolips, home to the Black Diamond was the source of Wrath's prison. He was banished inside the Heart of Darkness and this diamond was buried on the dark side of the moon. Somehow the Heart was discovered and split into a thousand pieces one of which arrived on Earth, and into the hands of Dr. Bruce Gordon. A local Seer possessed by Wrath's influence cut Gordon with the diamond and thus Eclipso was born anew. However Gordon fought Eclipso within and they were eventually split and Eclipso used Earth's heroes in a plot to spread eternal darkness and despair. To avenge his dead sister Alex Montez scarred himself with runic spells and injected himself with black diamond entrapping Eclipso. To trap him forever Alex committed suicide but this proved a mistake and Eclipse was reformed in a new Black Diamond. Jean Loring discovered the gem and willingly embraced Eclipso and they became one. Joining forces with a seduced Spectre she waged another war for eternal darkness however Shadowpact were able to save Spectre and trap Eclipso magically in orbit in the light of the sun. Main Story - 3: Hmm what to say? First off, personally this issue was fun, it honestly was - did it fit into Countdown? No. Bizarrely this seemed like a reverse tie in to the non-event that is Black Canary and Green Arrow's wedding. Sadly I couldn't care less about the Canary and Arrow getting married and this seemed like a waste of a vital chapter for the sake of roping in the wedding. It seemed VERY odd that all the set up from the previous issue seemed to be thrown out window or altered for comedy effect. I like how they twisted it, as much of what was set up just didn't work. Similarly playing much of the issue for slapstick didn't wholly work either. Hassan wasn't funny, Kara and Cassie were horrifically surfer chick gigglers this issue - are they six years old? Here more so than past issues heavily revealed Paul Dini storytelling especially with the comedy element. Some of which I loved. Tony Bedard I'm certain came in to fix the past few issue's mistakes and unlike in Supergirl he didn't really do a great job this time round. Case in point - re-read the hypnotizing of Hassan it's explained it couldn't have worked - but it did - the answer to this plot hole - gloss over it with a joke. Rinse and repeat this joke later in the same issue. Too much time this issue was spent on the bachelorette party. Jimmy needn't have featured in this issue for all it revealed in development and where is his sidekick Krypto? From the TIE IN. Wonder Girl and Supergirl seemed like two girls in need of a good kick up the rear. Over all this felt like a bad rip off of a Marvel Holiday Special (which is crap to begin with). Mary refuses to listen to common sense and out of revenge for Zatanna's actions she agrees to give a weird stranger some of her power... yes Mary you sure showed her. Then - don't get any back up just follow the weird voice across the world and no don't expect anything back despite the fact you're harping on about how people have done you wrong and betrayed you or tricked you... it couldn't happen again could it? No of course not, it's only... Eclipso. Oh they aren't important - instead we want to see The Wayan Brothers in White Chicks 2: Scheming Drunk Superteens. The most interesting and plot developing part of the book this week and their part seemed rushed through and that's a true shame. If it's funny I'll decide for myself! Back-up Story - 2: The most muddled profile so far. It did explain how Ecpliso started from day one and not being a fan of him/her it was very informative - especially giving us a glimpse at the extent of her power. Back-up Art - 3: Though the origin and scripting itself are cluttered the artwork is sharp emotive and as descriptive as it can be in two pages! Cover Art - 2: First off, is a Bachelorette party really all they could come up with this issue - part of DC's biggest event of the year... um no. Star Girl wasn't a guest that we saw... shouldn't she have been substituted for Cassie?